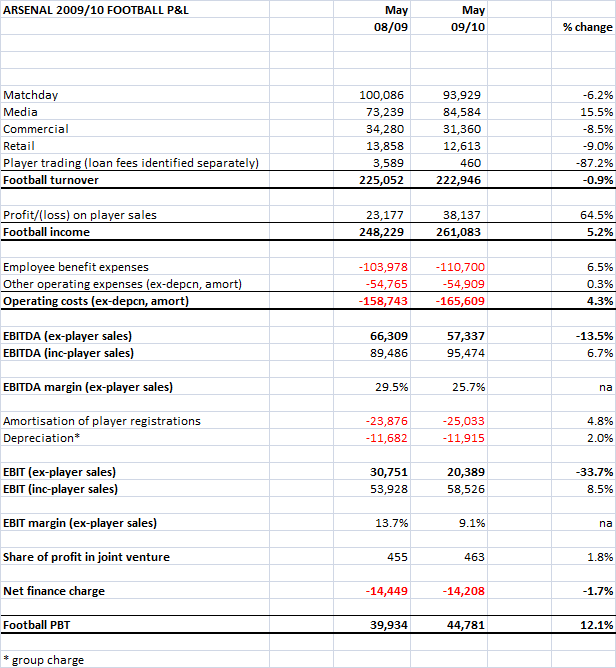 Red Football parent companies issues two new shares each: for £249m! As expected after passing resolutions on 22nd November allowing the issue of new shares to repay the PIKs, the two parent companies of Red Football (Red Football Joint Venture and its parent Red Football Shareholder) have today filed documents at Companies House confirming they have issued new shares. You can see the documents here (RFJV) and here (RFS). Both companies issued two new shares each on PIK repayment day (22nd November). For both companies, one share has a paid up amount of £31,578,649.41 and the other share £217,525,995.10 for a total of £249,104,664.51 (that is how much was paid for the shares). Crucially, these new shares rank pari passu with the existing shares in each company, that is to say that they have no additional rights that the existing shares do not have. 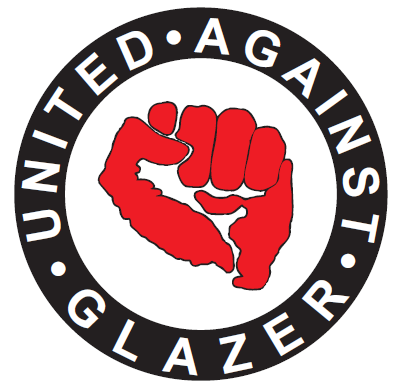 Could the split between two shares (13% and 87%) represent the proportions of the PIKs owned by the Glazers and third parties respectively? Prior to these share issues, RFJV had 988,183 shares in issue and RFS had 990,002 shares in issue. Given these new shares represent only around 0.0002% of the shares already issued, we can pretty safely conclude that they have not been issued to a third party (who would pay £249m for 0.0002% of United?) and have therefore been issued to a Glazer company. We will know definitively in January or February when the "Annual Returns" are filed at Companies House. We are thus left with the mystery of where the Glazers got £249m from. I stand by my view that this money probably came from a debt financing at the level of one of their US holding companies (the next company in the chain above Red Football Shareholder Ltd is "Red Football Limited Partnership" of Nevada). Others may think that the family had the cash knocking around somewhere. Today's filings probably mean we will never find out the truth as if there has been new debt issued it is in America where we cannot see the details. At least we're top of the league.... Happy Christmas and happy New Year. "....allot ordinary shares in the Company or grant rights to subscribe for, or convert any security into, ordinary shares in the Company...."
That means the companies are now authorised to issue new shares (or rights to subscribe for or buy new shares). You can download the documents here for RFJV and here for RFS (if you really want). Well all we know for certain from this is that in order to pay off the PIKs, the Glazers are issuing more equity (or rights to equity) in one or both of United's parent companies. The mystery of course is who they are issuing such equity to. It could of course be themselves. If they have found the £243m needed to repay the PIKs down the back of a sofa in one of their many Florida properties, they could be subscribing for more shares themselves using that money. Or it could be a third party who has provided finance to repay the PIKs (i.e. new debt for old). Will we ever know? It's hard to say, as it depends on the exact structure used in any refinancing and whether it took place in the US or UK. There will be a "post balance sheet event" note in the RFJV and RFS accounts when they are published in the new year. That may tell us more. One of the consequences of the frenetic financial re-engineering of the Glazers since the 2005 takeover of Manchester United is the huge amount of information the club has published about its finances. Starting with the August 2006 refinancing Investment Memorandum (the "2006 IM"), running through the bond prospectus and into Red Football Ltd's annual and now quarterly accounts, we have been given an incredible insight into the club's financial affairs. This insight allows us to see in extraordinary detail the different sources of income and what this money is spent on. 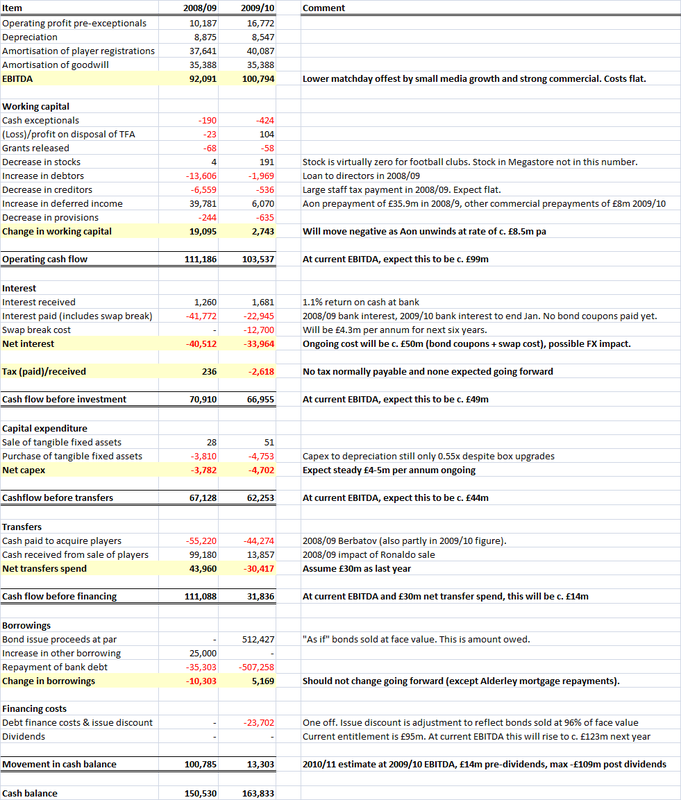 This post lays out in full where United's income comes from (I will do a separate post on costs) and compares the most recent figures (for the 2009/10 season) to the first year of Glazer ownership (2005/06). The 2006 IM splits revenue into 24 component categories and costs into 8 categories. 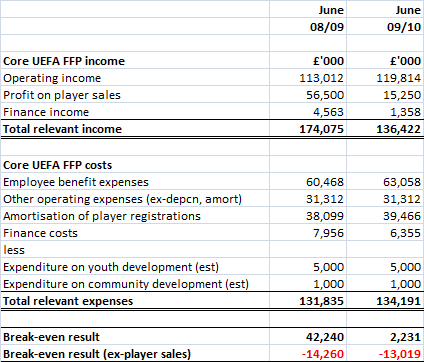 The 2006 data relates to the twelve months to June 2006 (rather than the 14 months reported in Red Football's statutory accounts for that year, caused by the change of year-end from June to April). 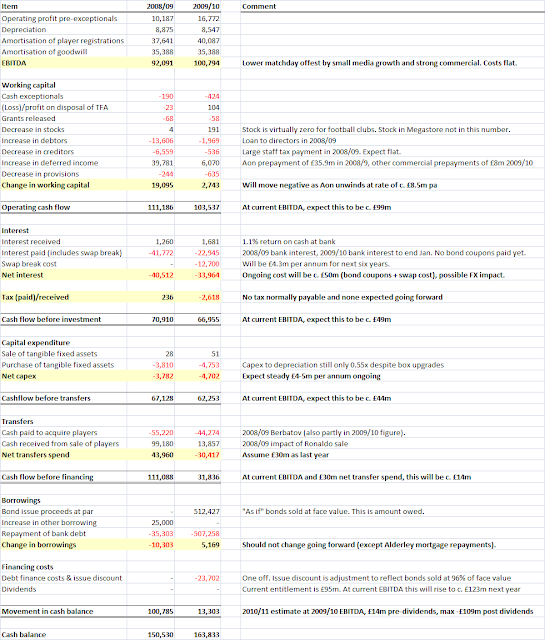 Using the bond prospectus, Premier League and UEFA figures and the 2009/10 accounts, I have rebuilt these revenue splits for the last financial year. I have supplied footnotes at the end of this post setting out the source or method of estimate for each number. Only a few of the smaller categories are pure estimates. Please contact me if you spot any errors or have any queries. 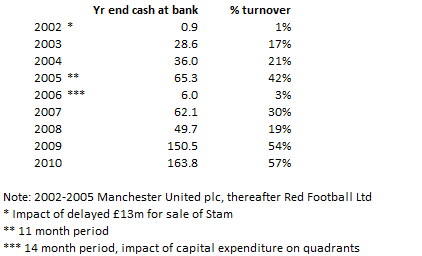 Between 2006 and 2010, United's turnover (looking at the 12mths to June 2006 not the 14mth period) increased by £123m or 75%, equivalent to 15% pa. Of this, c. £8m (5% growth over the four years) comes from MUTV being consolidated into Red Football's accounts. Although the expansion of the club's commercial operations is much commented on (and is now the only area showing major growth), over the Glazers' ownership better PL and CL media deals are actually more important factors, and the impact of the stadium expansion and ticket price rises are also key to the overall performance. Matchday income has grown by 43% since 2006 with the vast majority of this coming in ticket sales (STs, execs and boxes). The upper quadrants started under the plc were completed in 2006/7 so the 2006 figures reflect the final year of the smaller Old Trafford. 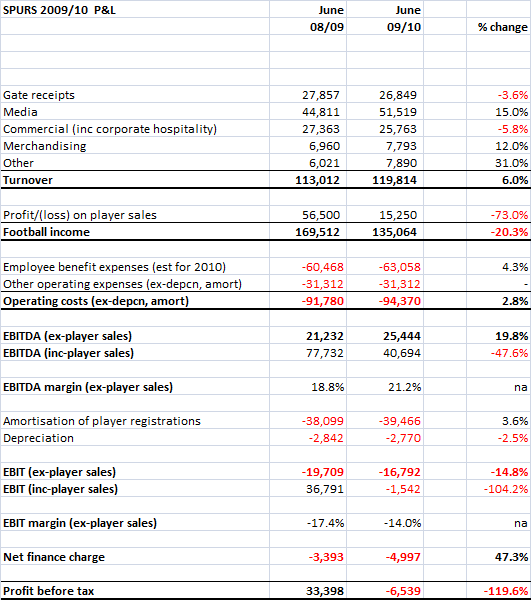 The quadrant expansion added 11.8% to capacity, so we can strip this out of the ticket sales figures to see how prices and "mix" (the higher proportion of execs) have impacted revenue. 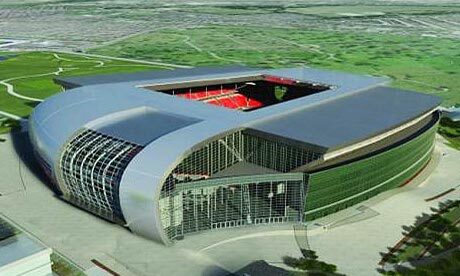 Of the c. £28m increase in PL ticket revenues, around £5m has come from the stadium expansion with c. £19m from higher prices and £4m from mix. The CL and domestic cup comparisons are obviously more complicated as the number of games played changes season by season. 2006 was a dark year for United in Europe as we went out (in last place) at the group stage. Taking this into account, we can split the £5.9m increase in CL ticket revenue into £600k from stadium expansion, £5m from higher prices and £300k from mix. 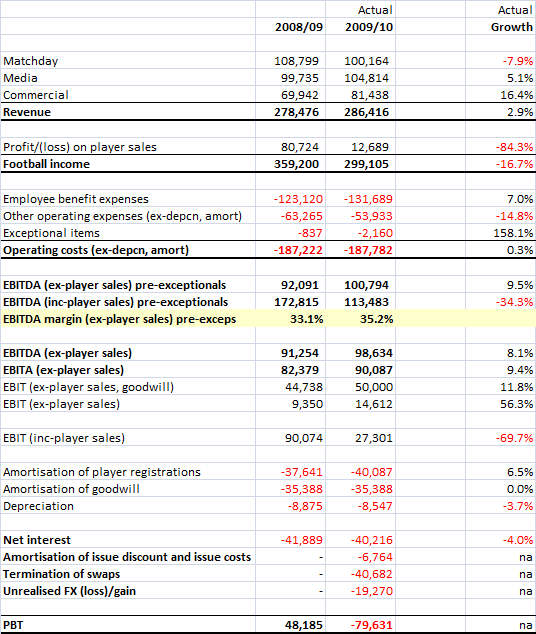 The domestic cups are largely immaterial (and the revenue is shared of course). Hospitality and catering income has grown over the four years, but is actually relatively unimportant at just 4% of total revenue. 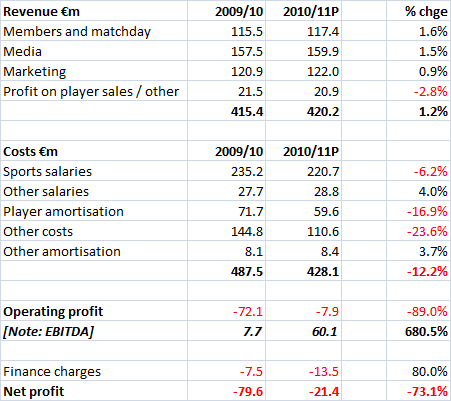 In aggregate, the club has reduced its reliance on matchday income as media and commercial have grown. Of the £86.2m of total ticket revenue, it is unlikely more than £40m (or 14% of total club turnover) comes from normal season ticket holders and One United members. Media is the largest element of United's income and is still dominated by the collective TV deals for the PL, CL, FA and Carling Cups (the latter two being very small). 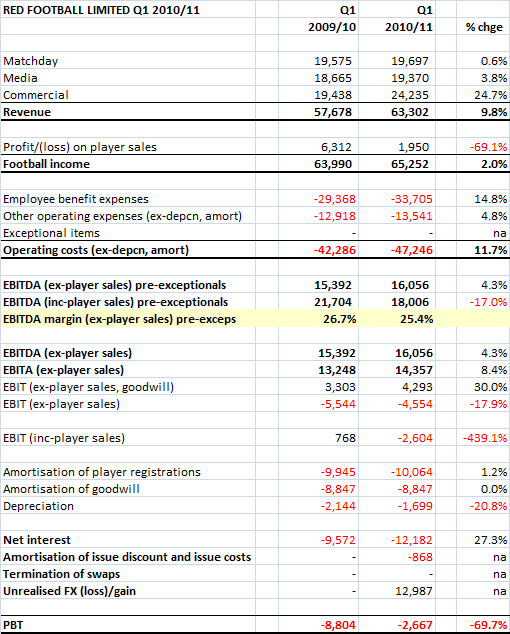 The figures for media income are published by the Premier League and UEFA so we can be very confident about the split. The non-collective media now includes MUTV which was not consolidated in the accounts in 2006. Neither MUTV nor MU Interactive make any money and the club's aspirations to develop "owned" media rights have so far not met with any great success. United came second in the league in both 2006 and 2010 so the £22.4m rise purely reflects the improved collective deal achieved by Scudamore and his team. In Europe, there are three factors at play in the £28.6m growth; currency moves, better playing performance and a greatly improved overall TV deal. The pound has declined vs. the Euro and Swiss Franc by 24% over the four year and this adds around £5m to the underlying improvement. Progression to the quarter finals last year compared to group stage elimination is worth c. £10m, with the remaining £13-14m coming from the far better overall deal negotiated by UEFA. 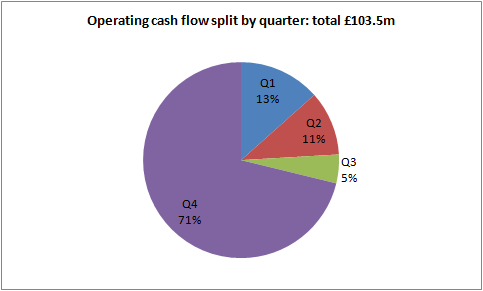 Adding CL TV money to ticket sales, the total of £50m is equivalent to 17.5% of turnover and 50% of profits. Although a bit of Thursday night Channel 5 participation in the Europa League would bring in income, CL qualification remains vital to the financial health of the business. In the unlikely event that United (or any other English club) won the "quadruple", the total media income under the current collective deals would be around £116m. As is well known, commercial is the engine room of United's profit growth at the moment, although so far during the Glazers' ownership it has not been nearly as important as growth in TV deals. We know the exact payments each year under the plc's Nike deal from the 2006 IM (during the current 2010/11 year there is another contractual step-up to £25.4m per annum). The 2006 shirt sponsor was of course Vodafone and the (ill-fated) AIG deal marked a 50% increase on this. 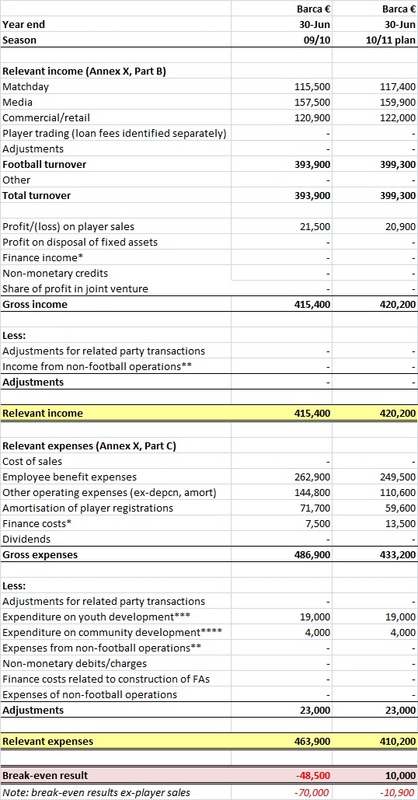 From this year the club is recording c. £20m of income from Aon although given the prepayment of £35.9m in 2009 this will actually bring in less cash (only c. £11m) each year than was received from AIG. 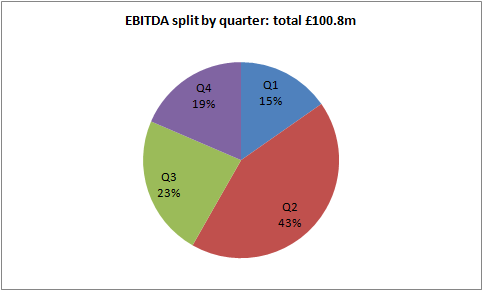 The first quarter results for 2010/11 showed commercial income reaching £24.2m (equivalent to c. £97m annually). The £4.8m increase in Q1 compared to the previous year includes the £1.5m extra from Aon and c. £0.5m from Nike mentioned above. The Glazers' and their apologists would like the world to think that the club's rapid revenue growth in recent years is largely down to them. This is almost exactly half true. Half of the rise in revenue (stripping out the impact of consolidating MUTV) comes from decisions the Glazers have taken, primarily the change in approach to commercial tie ups and the sharp rise in ticket prices. Higher prices and commercial deals each increased revenue by c. £30m over the period. The remaining growth has come from better collective TV deals (£36m), the stadium expansion started by the plc (c. £6.5m), factors outside the club's control such as currency fluctuations, the step-ups in the Nike deal and the PL's improved sponsorship deal with Barclays (c. £6.5m) and finally a far better Champions League campaign compared to 2006 (for which I am not giving credit to the owners). Other than the genius idea of ramping up the cost of going to the game, only 26% of the rise in revenues since 2006 can be ascribed to the Glazers' management "talent". 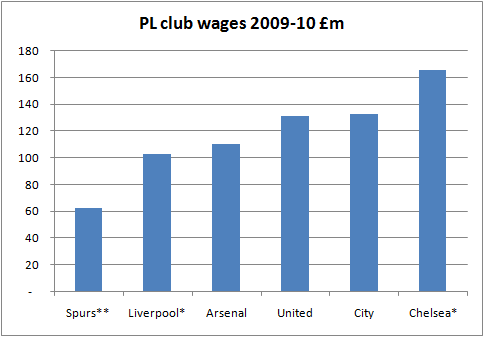 The rest is largely the bonanza of TV money and the true talent of Fergie and his players over the years. 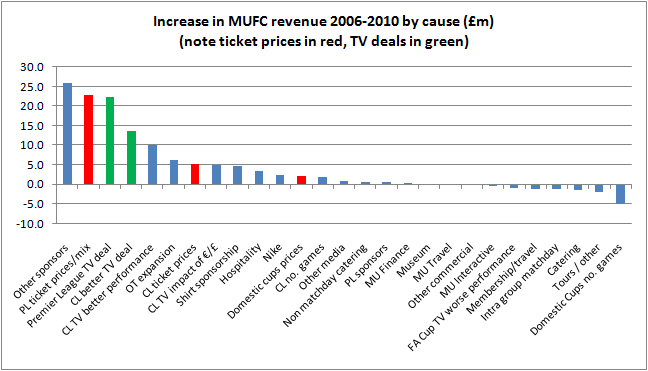 You can see the impact of each category in the graph below (I've marked out ticket price increases in red and TV deals in green). United's consistent CL participation over many years, regular titles or second place finishes in the league, the (still just) sold out 76,500 capacity stadium and global cache makes it a phenomenal money machine. This post will hopefully have explained exactly where the money comes from and help people decide what the future may hold. 1. 2008/09 Premier League ticket income from page 51 of bond prospectus increased by 2% average ticket price increase in 2009/10. 2. 5/6ths of 2008/09 CL ticket income from page 51 of bond prospectus increased by 1% to reflect ticket price increase in 2009/10 offset by lack of higher priced home semi-final. 3. 4/5ths of 2008/09 domestic cup ticket income from page 51 of bond prospectus. Price not adjusted to reflect higher proportion of lower attendance Carling Cup home games in 2009/10. 4. 2006 IM shows £200k hospitality revenue per home game and £250k of catering revenue per home game. These numbers assumed to have reversed due to expansion of hospitality facilities (offset by reported weak sales in bond prospectus) and impact of recession on supporter spending. 5. One United membership has declined since 2006 (as ST no.s have increased), income from membership and travel assumed £2m. 6. Relatively short tour in Asia in 2009/10 pre-season estimated to have generated £4m. 7. 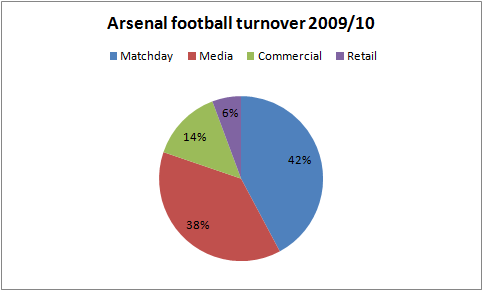 Intra-group matchday cross charge assumed constant at 2006 level of 4.3% of gross matchday sales. 8. PL TV distribution for 2009/10 as published by Premier League. 9. Assumed £100,000 for televised FA Cup tie vs. Leeds. 10. 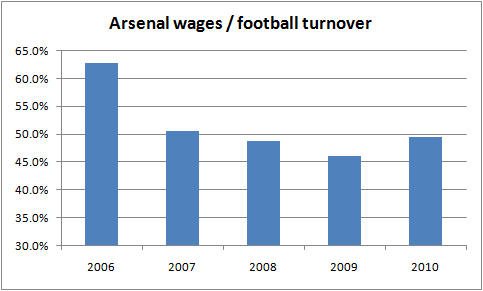 Assumed flat £200,000 Carling Cup income vs. 2006 (when we won it as well). 11. CL TV distribution for 2009/10 as published by UEFA. € amount converted at average exchange rate for the year. 12. 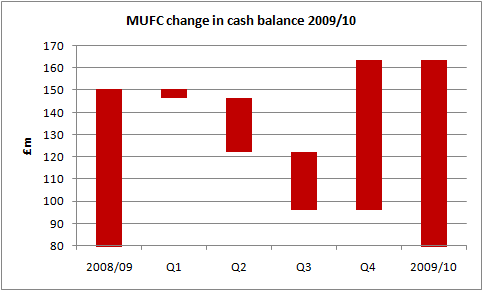 MUTV income assumed flat on 2008/9 and derived from MUTV accounts for that year. 13. MU Interactive income derived from that company’s 2009/10 accounts. 14. Other media is residual to take total to the reported £104.7m. 15. Nike income is set by contract with progression published in 2006 IM. 16. Widely reported £14.1m pa received from AIG. 17. Residual after all other commercial areas have been estimated. 18. 2006 figure assumed to have grown 5% per annum. 19. PL sponsorship (Barclays) as reported by BBC. 20. Assumed to have grown in line with inflation since 2006. 21. Assumed to have grown in line with inflation since 2006. 22. Assumed to have grown in line with inflation since 2006. 23. Assumed to have grown in line with inflation since 2006.